No matter what the first day of a new week throws at you, no matter how looming the rest of the days before the weekend seem, a truly, madly delicious pizza promises something familiar, something reliable, something known. It's confirmation that all the heaviness of the world will be held at bay—if only for a little while—by a combination of bubbling mozzarella, sweet fennel sausage, and balsamic-glazed radicchio. Beginning with the "Mother Crust" recipe, Lenzer argues that pizza dough is a tabula rasa for whatever healthy fresh ingredients you have on hand. To make pizza a nightly affair, she suggests preparing the dough on Sunday—in less than 30 minutes—freezing it, and simply transferring it to the fridge to thaw on the morning you plan to cook. 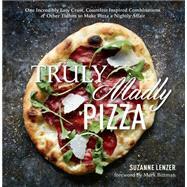 Lenzer gives the timestrapped home cook countless combinations for a healthy, delicious (and quick!) weeknight meal. Balancing lighter healthy alternatives like Summer Squash with Lemon Zest and Ricotta with indulgent options such as Spicy Shredded Pork with Sweet Onion Jam and Burrata, in addition to bonus recipes including "Salad thoughts," "Small bites," and even a few ideas about wine, this book covers all the bases. Lenzer's comforting voice adds a homey touch to her artisanal recipes and immaculately styled photos. Suzanne Lenzer is a New York City–based food stylist, writer, and recipe developer. Having graduated from the Institute of Culinary Education, Lenzer is the coauthor of the New York Times bestseller Cook Like a Rock Star. She lives with her husband in Manhattan and Connecticut.